The final evening display of the year at Old Warden, Flying Proms aside, had one of the most memorable line ups for a number of years. 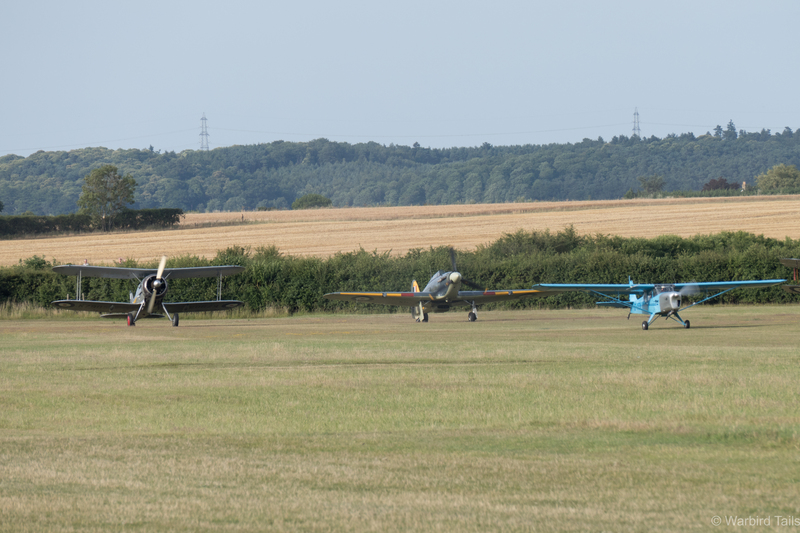 A huge number of wonderful visitors were laid out on the airfield, set to soak up the summer evening sun. 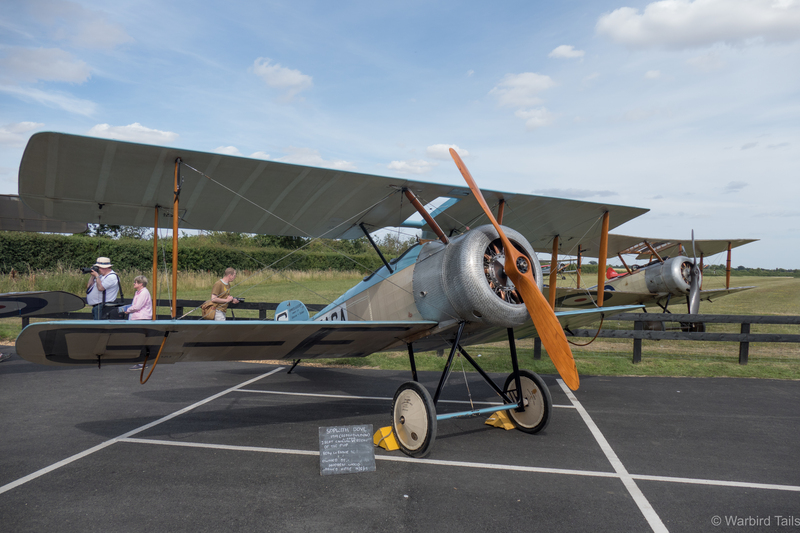 The static display featured an impressive gathering of four Sopwith types. Seen here are the Dove and Pup. As always I had one eye on the weather forecasts during the lead up to the show, things weren’t looking great with incredibly high winds predicted for most of the week. Luckily on the day conditions weren’t as bad, though there was still a stiff crosswind for the start of the show. 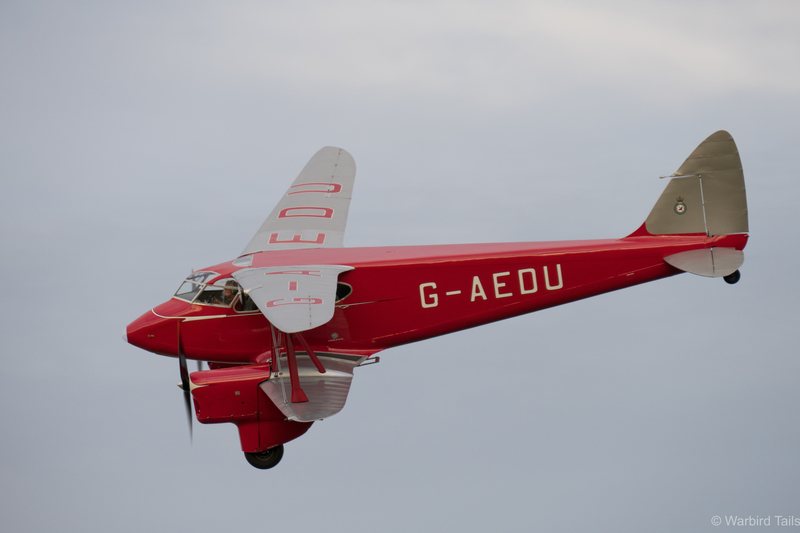 N3200 on the ground at Old Warden was a great sight to arrive to. The reason the winds were such a concern was that this show marked the debut outing for two First World War types recently shipped over from New Zealand. Following on from the pair of BE2s last year, the Vintage Aviator Limited sent over an Albatros D.Va and Sopwith Snipe. These two machines are set to be operated by the World War One Aviation Heritage Trust. The Snipe is a great example of late first world war aviation, powered by a 230hp rotary engine. 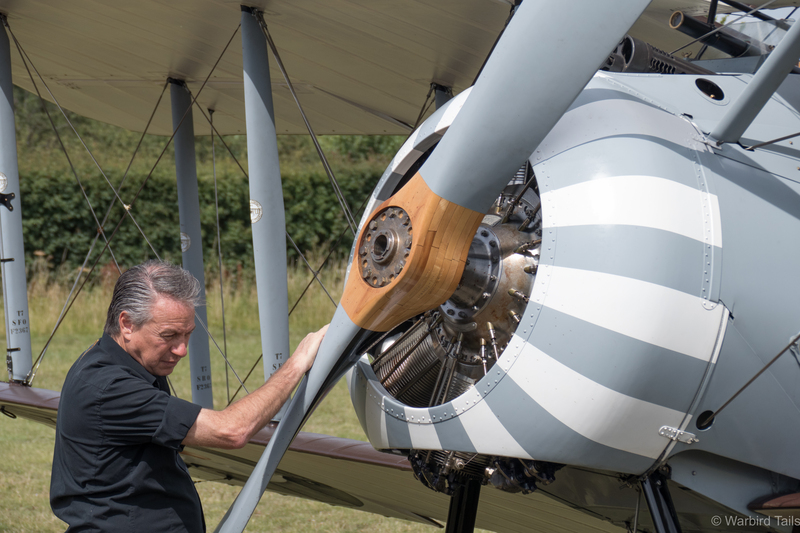 Gene DeMarco preparing the Sopwith Snipe for an engine run before the show. Arriving early afternoon we were greeted by an announcement that the Snipe mentioned above would be performing an engine run close to the crowdline. This was the first time I’d seen a rotary engine running up close, I think it was even louder than I’d expected! The sight, sound and smell of the Snipe was incredible and a great way to start the day. Dodge Bailey in the hot seat running up the Bentley BR-2. I Spent most of the afternoon wandering around the crowd line looking at the great collection of aircraft in display, I admit to giving the new arrivals a lot of my attention. Both the Snipe and Albatros are incredible examples of the Vintage Aviator’s craftsmanship. 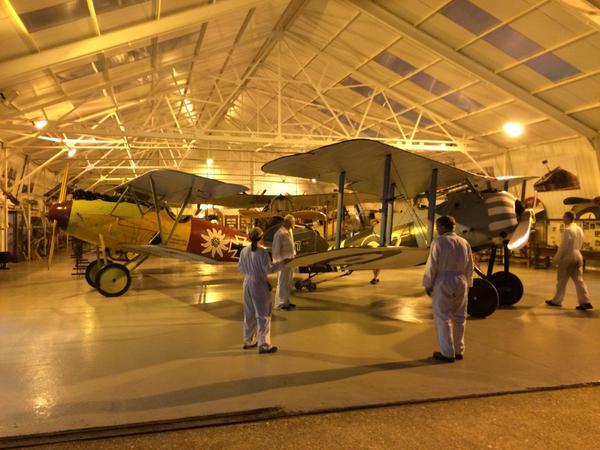 Joining the Snipe on display were three other Sopwith’s. The collection’s Pup took part in the flying display, while the Camel and privately owned Dove were on show in the static display, offering great up close viewing. The Albatros was the other star guest in the display. 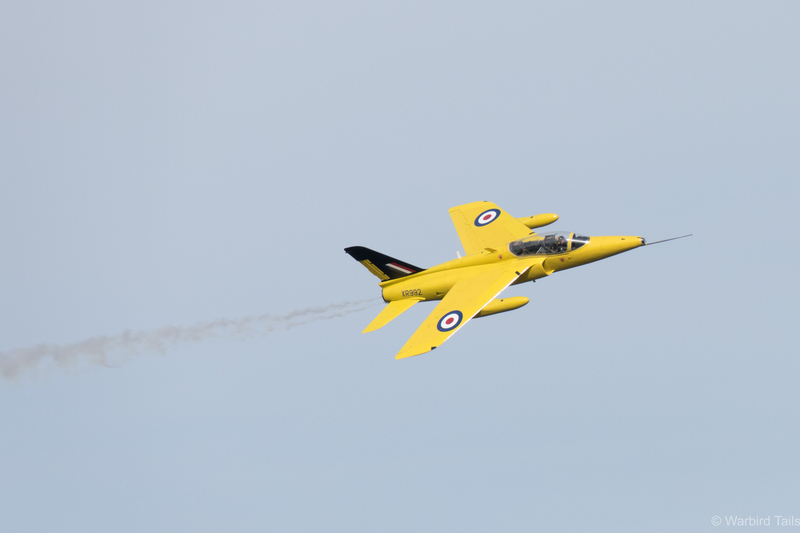 Flying kicked off at 6 o’clock with the arrival of the Folland Gnat from North Weald, displayed by Chris Heames. I was expecting one of the red aircraft to appear, so it was a pleaseent change to see G-MOUR, the yellow jet performing on its own. Chris had apparently requested extra height for his display, which was certainly put to good effect, with plenty of high level loops and rolls over the airfield. 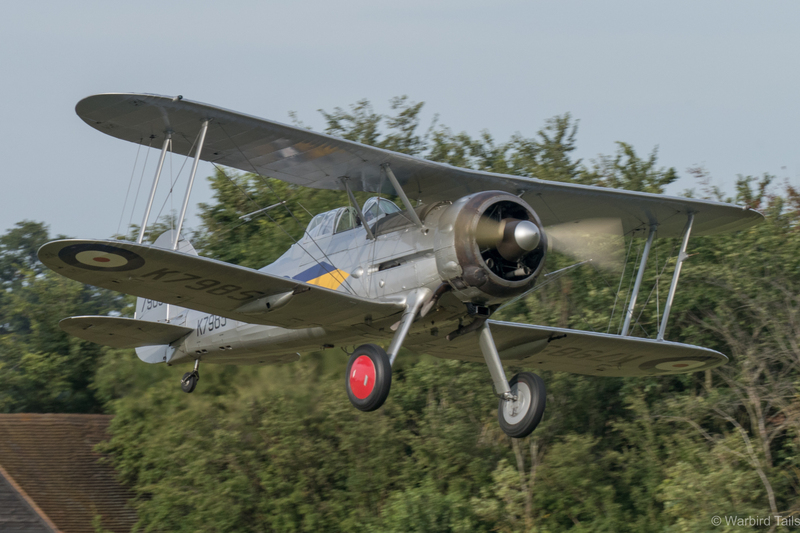 Chris Heames brings G-MOUR in for a topside pass. Only at Old Warden could a display turn from a Gnat to a pair of Percival Mew Gulls, the pair were first seen together at the Race Day show last year, so it was great to see David Beale’s replica joining the collection’s example again. The pair performed together before splitting into solo routines. The Mew Gull pair running in. Another one-off display on the day was an incredibly rare four ship of Miles Magisters. The four aircraft are the only surviving airworthy examples. Those arriving early to the show were lucky enough to see the four trainers fly twice, as they flew an air to air sortie in the afternoon. For the main display they flew a graceful sequence of passes in box formation before an on crowd break from line abreast. This historic sequence closed with a flowing tail chase around the airfield. The Magister four ship passing overhead. Another shot of the Magisters during the tail chase segment. 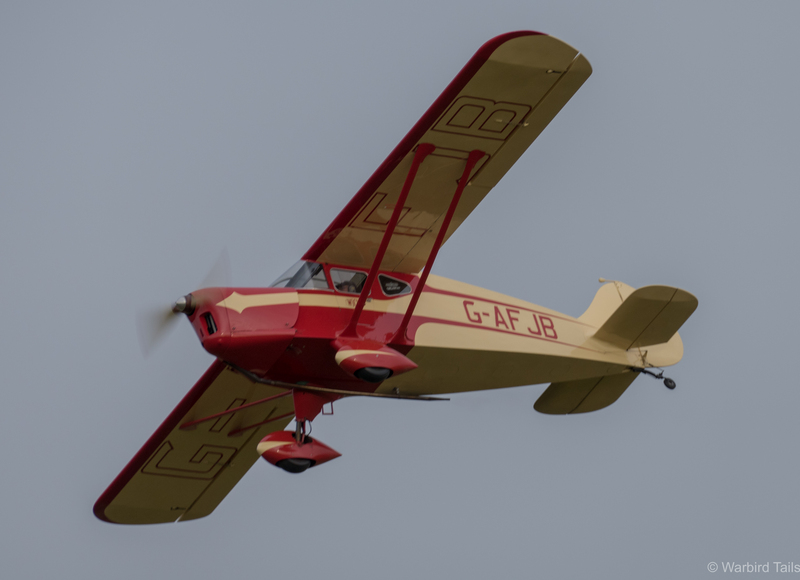 A rare solo outing from an Auster followed, putting in a spritley display with plenty of dynamic turns along with slow passes. The amusing sight of the Auster getting airborne ahead of the Hurricane and Gladiator. 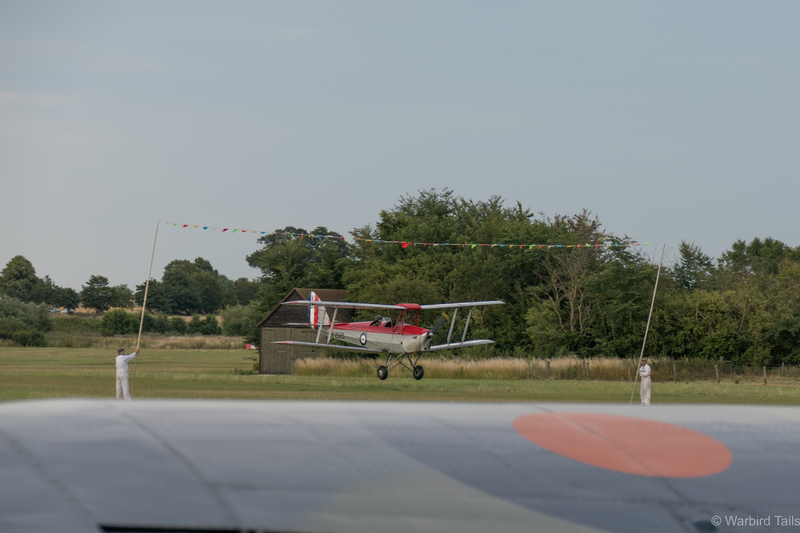 Taking off behind the Auster, in a strange combination, were the collection’s Sea Hurricane and Gloster Gladiator. Both are familiar sights at Old Warden, but I think Saturday’s outing ranks up there as among the best I’ve seen, with the pairs section especially low and fast. Chris Huckstep put in a great performance in the Sea Hurricane. An impressive three ship of de Havilland Moths, consisting of Hornet, Puss and Leopard, was rounded off by a new aircraft to me, the Wicko GM1. These 4 classic tourers made for a beautiful sight in the evening light as they followed each other through a series of manoeuvres. Back to World War 2 and another star visitor, Spitfire Mk. I N3200, performing its first away day from Duxford since being donated to the Imperial War Museum. 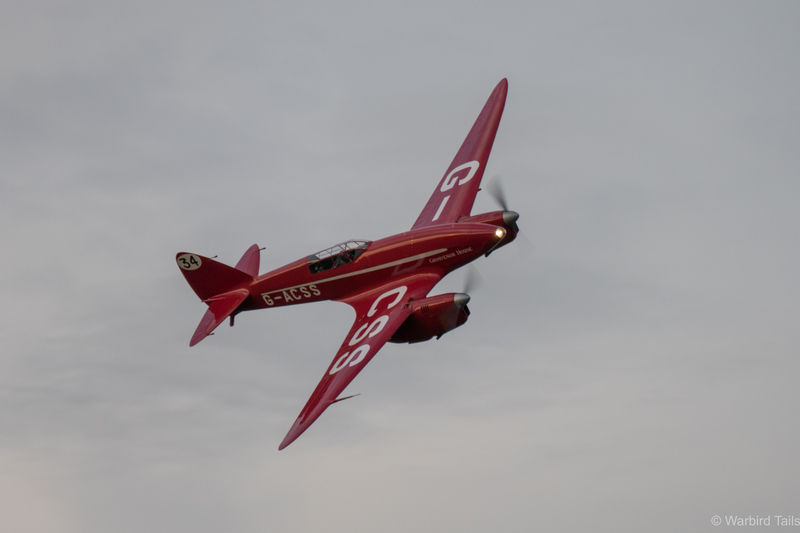 Dave Ratcliffe clearly modified his display to the venue, performing countless sweeping low passes around the Shuttleworth curve, with some graceful barrel rolls thrown in for good measure. The combination of an early merlin and the eerie whistle given off by the non-standard rear view mirror, made for a superb combination. 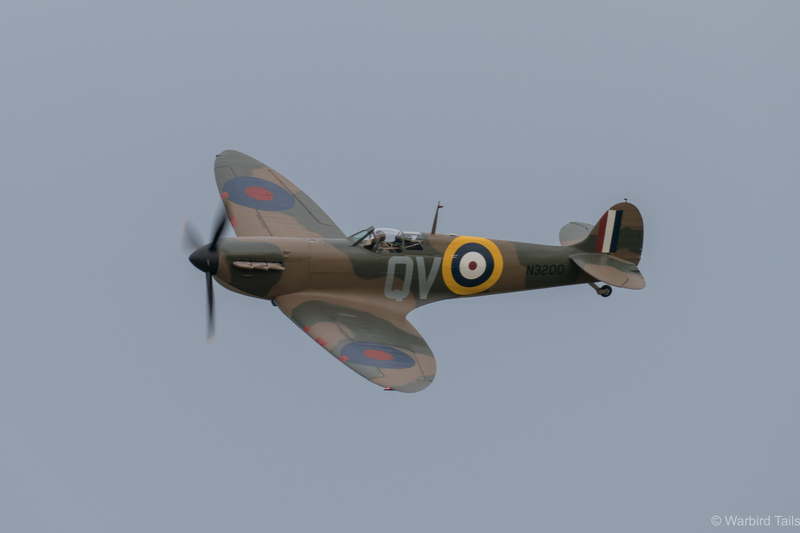 The Spitfire flies past during its display. As mentioned above the winds remained quite strong for the afternoon, so the decision was made to move the extensive First World War collection of aircraft into the late slot, normally filled by the Edwardian aircraft. 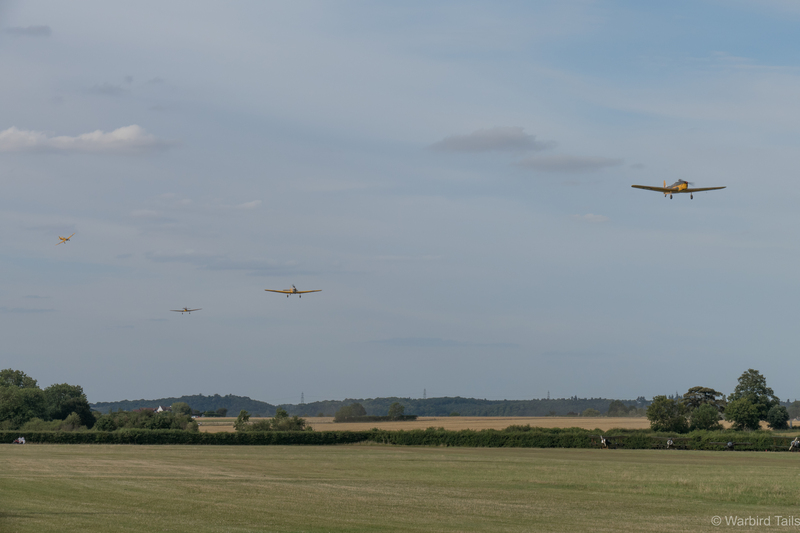 This left a gap in the flying display which was filled by a welcome return from the Barnstorming routine. The display features the usual games we are used to seeing, with flour bombing, balloon bursting and the inevitable limbo. Watching aircraft such as the Magister and Tiger Moth performing limbo flying is always a thrill, you can’t help but smile. Saturday saw the return of the “Barnstorming” routine as well. The Slingsby Petrel glider was up next, glider displays have become a great fixture at Old Warden lately and really serve to bring things down a gear with graceful, silent displays. 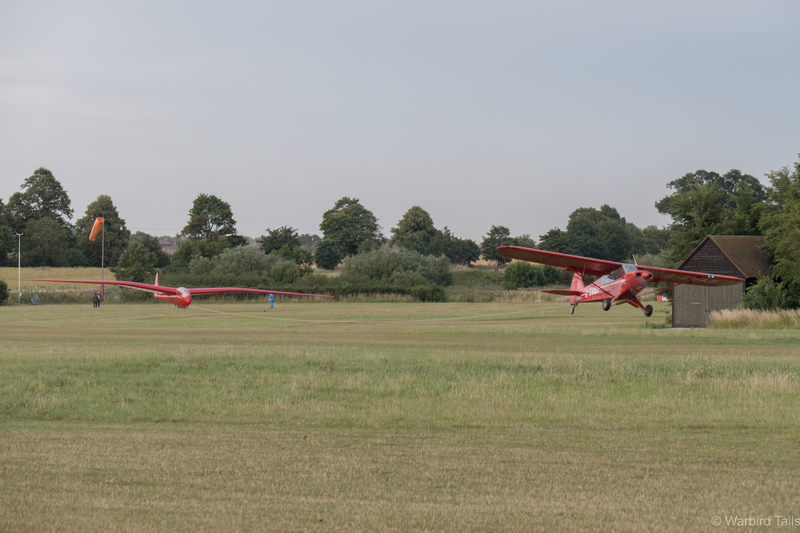 The Petrel glider gets airborne on tow behind the collection’s Super Cub. Following the gull winged glider was the ever enjoyable Hawker pair, consisting of the Demon and Hind, the combination of two Kestrel powered bi-planes is always exhilarating. Stu Goldspink especially, always seems to throw the Demon around to great effect for such a large machine. The Hind during its take off run. 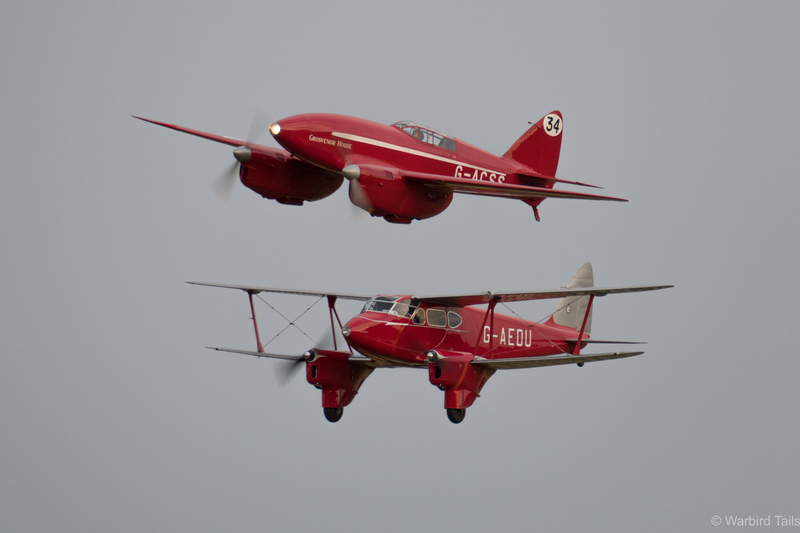 Then came the finale of the main display, with another outing from the de Havilland stable of designs. 1930s de Havilland designs are all wonderful, but none capture the grace and beauty that the two machines in this segment did. The DH88 Comet is one of my contenders for the most beautiful aircraft ever built and the machine that followed it in to display, the Dragonfly, is another! Seeing these two DH twins perform together was another incredible moment that I hope can be repeated in the future. No words required for this one! Following a single formation pass, Dan Griffiths started a powerful solo routine in the Dragonfly, with plenty of low passes and steep turns, making the most of some fantastic light. Dan Griffiths put in a great display in the Dragonfly. Dodge Bailey has been flying the Comet for a while now, and that can really be seen in his display, Saturdays routine still captured the same magic for me as the return of the type in September last year. This routine seemed lower, faster and louder than previously, there really are few aircraft I enjoy watching more than the DH88. Another great appearance from the Comet. After the usual late deapartures from visiting aircraft had taken place, it was time for the aircraft many had come to this event for, the First World War fighters. First to launch into the sunset was the Avro 504K, soon followed by one of the shows stars, the Albatros D.Va, recently shipped from New Zealand. 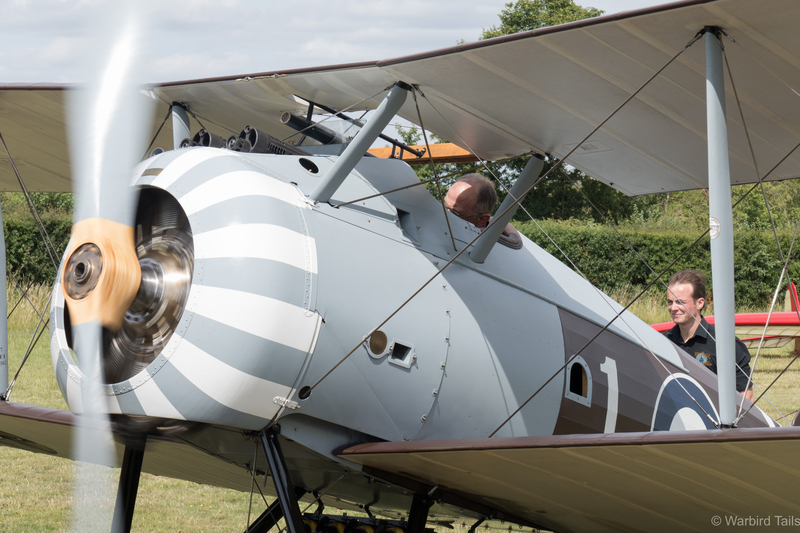 Keith Skilling, a renowned display pilot from New Zealand flew the Albatros in the display and showed it off to great effect, with plenty of low level passes and topsides. 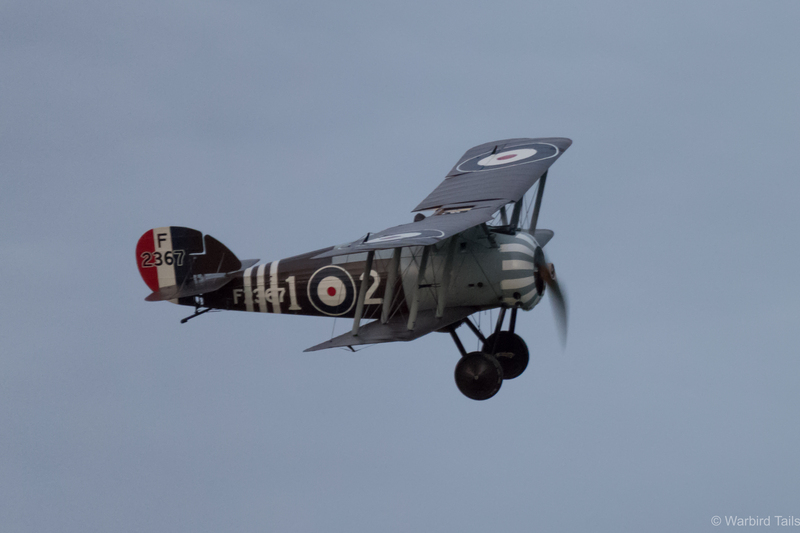 Making the most of the fading light, the collection’s Sopwith Pup got airborne and joined the Albatros for a few passes in formation, not many places you can see that! 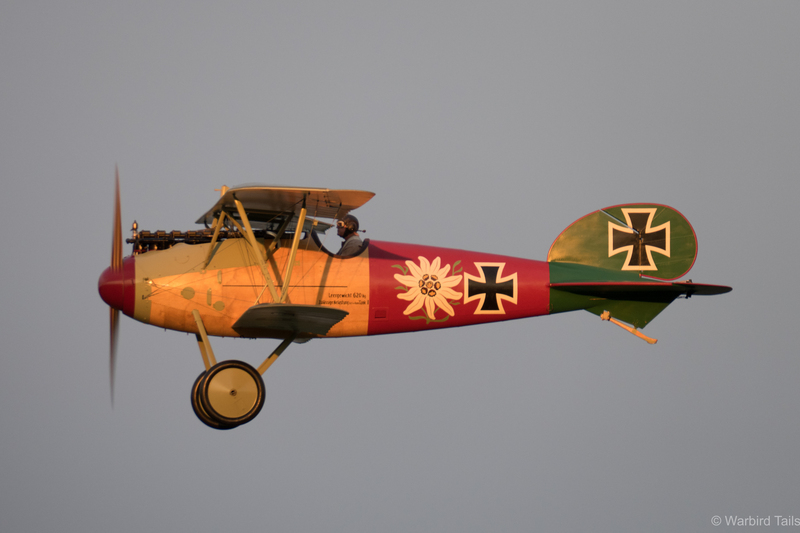 Keith Skilling displayed the Albatros in some wonderful light. The Pup and Albatros meet in the fading skies. 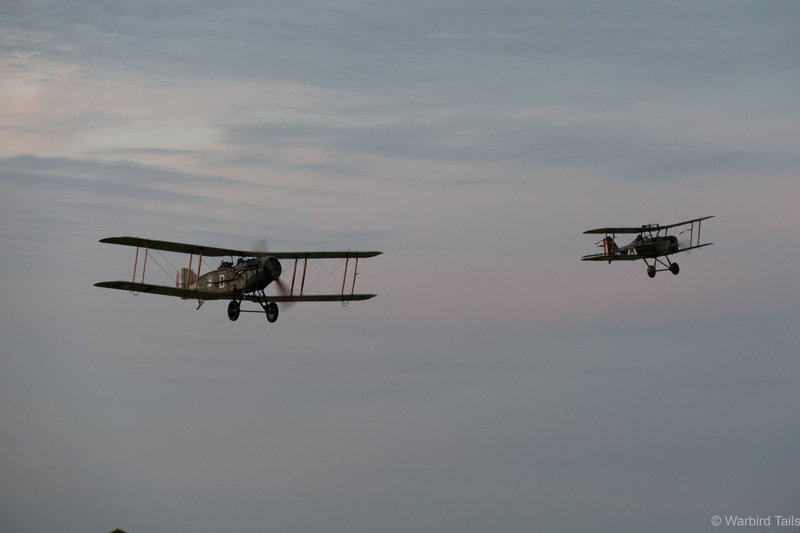 With the Albatros and Pup back on the ground, attention turned to late war designs, with the Bristol F2b and SE5a getting airborne into the now far darker evening sky. The pair performed solo displays before following each other round in loose formation. As you can see, the Bristol in particular looked incredible in the late evening skies. 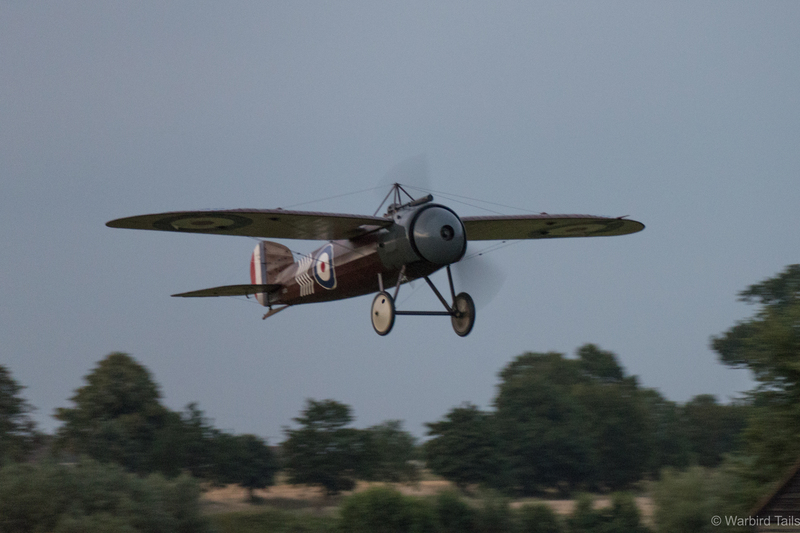 The finale of the show was two unique late war aircraft, launching from being the control tower, making use of the short runway, was the Sopwith Snipe. This was the machine I had been waiting for and it was every bit as impressive as expected. 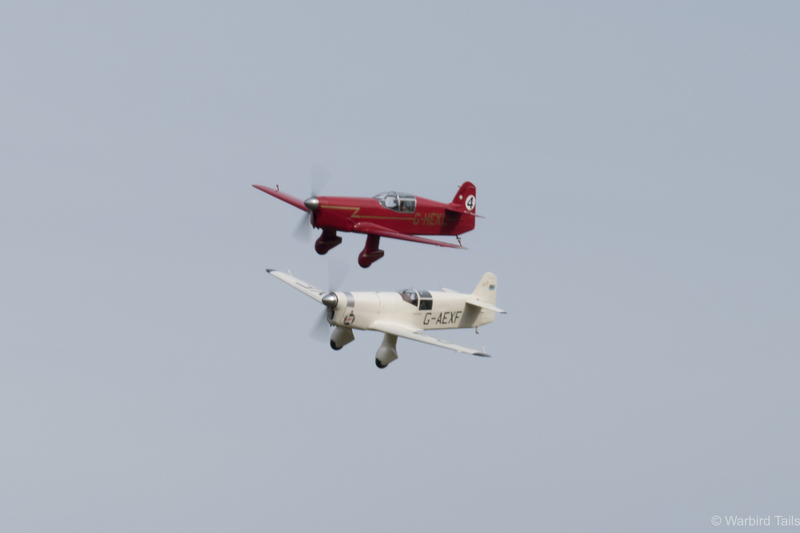 After showing off the Snipe’s impressive rate of climb off take-off, Gene DeMarco put the aircraft through its paces at high level, before being joined by the collection’s Bristol M1c reproduction. After the M1c landed, Gene really showed the Snipe off to the crowd, with some close, low level passes, letting spectators see and hear this unique fighter and the incredibly powerful rotary engine which powers it. Gene performed an excellent display late in the show in the fading light. Toching down after the sun had set, Gene taxied the Snipe back to the flightline and performed an engine run up before shutting down, as the propellor and engine swung to a stop, a fantastic evening at Old Warden came to an end. 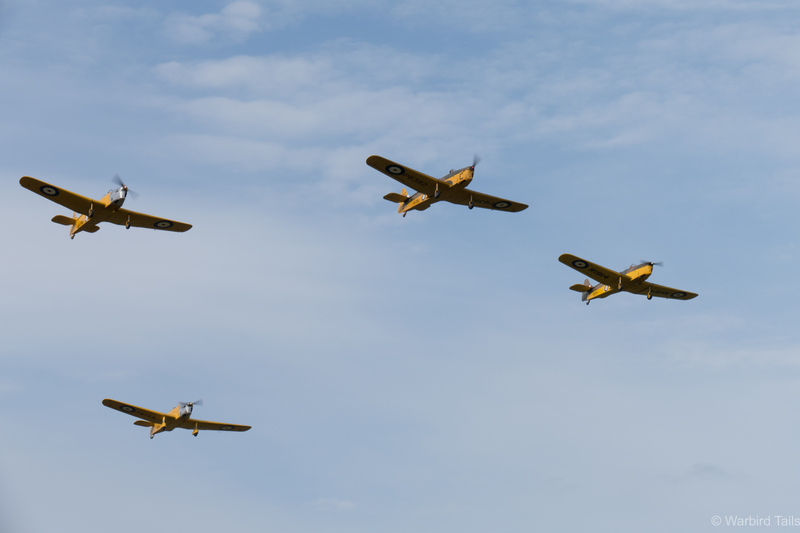 I don’t think there will ever be a greater tribute to those pilots of the First World War than those seven unique types performing at dusk. Two stars of the show are put back to bed in the hangar after a busy evening. After the show I stayed around to watch as the aircraft were towed away in the darkness. 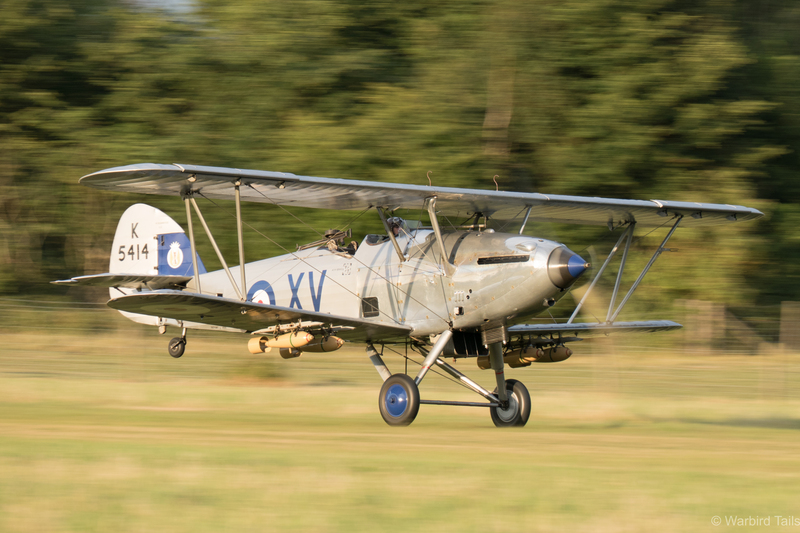 There is something truly remarkable about an evening show at Old Warden, that unique atmosphere is heightened and the evening light always makes for great conditions. This show can be applauded for a number of reasons, with so many star acts, but the magic of that First World War segment in the fading light is something that will no doubt stay in the memory of those attending for years to come. 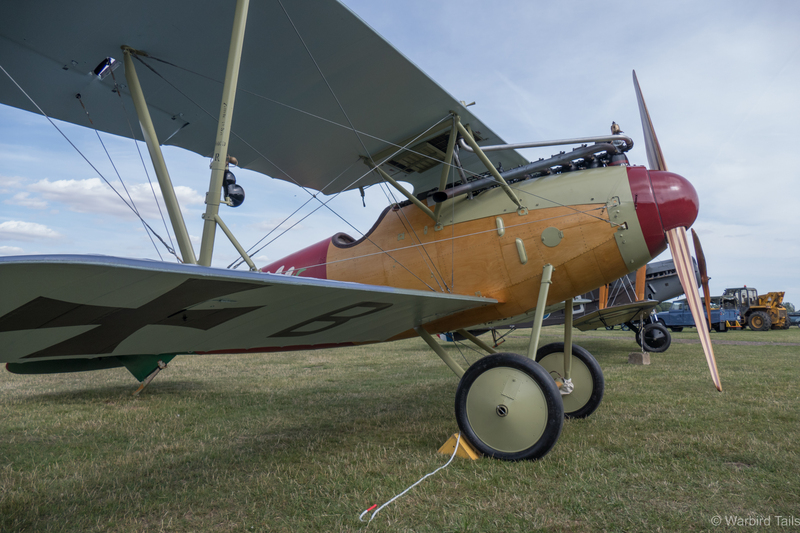 The next Old Warden show, on the 2nd August, will be another chance to see the Snipe and Albatros perform along with a number of other visitors and of course the collection aircraft. Having been to the military pageant and reading this I think Shuttleworth will (hopefully) be becoming a regular for me. I am still relatively new to the whole airshow scene having been once a year since 2011 (Waddington each year apart from this year which was the military pageant. 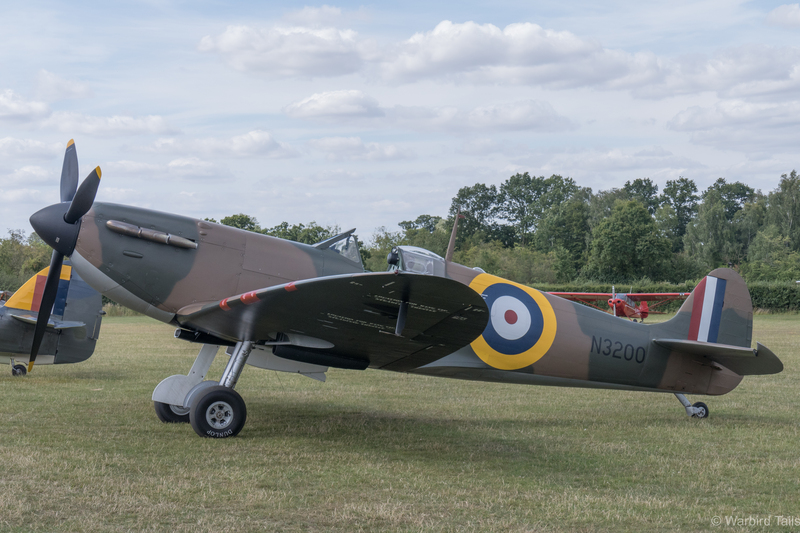 I have only been to two airshows before this (Farnborough in ’98 and Biggin Hill in 2010 – the traffic was enough to put me off doing Biggin Hill again) but Shuttleworth seems to be very well put together and has an almost personal touch to it as you can get so close to everything.